One of the easiest battery saving tricks is keeping a short screen timeout, and a 15-30 second delay works well in most scenarios. Even so, there are times when you absolutely need your device’s screen to stay lit – like when reading an article, following a recipe or viewing a map. Android is scarce in options when it comes to this (we’ll discuss these too) but there are some great apps available in the Play Store which allow you to keep that short screen timeout and at the same time prevent the display from automatically dimming in a variety of situations and for specific apps. The basic option lets you setup the screen timeout in the Settings menu, under Sound and Display -> Display but even if you choose the maximum time for the screen to stay awake it’s not a great long-term option. It’s likely you’ll forget to turn off the screen (at least sometimes) and it will stay on for no good reason, just draining your battery faster. A second, more effective option can be enabled but you need to have Developer Mode for that – go to About phone (or About device) in the Settings and tap the Build number seven times in rapid succession to turn on Developer mode. 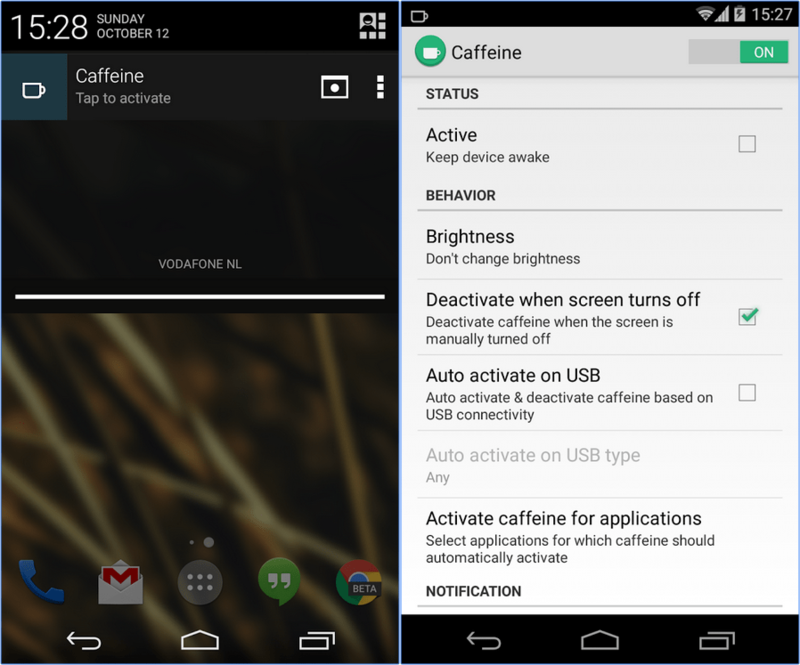 Now you can go to Developer options from the Settings menu and enable the ‘Stay awake’ feature. This will prevent your screen from going to sleep while the phone is plugged in. Many apps offer this feature as one of their own (including the ones I’ll present below) so using one for this feature alone is not worth the effort when you can enable the same setting on stock Android. 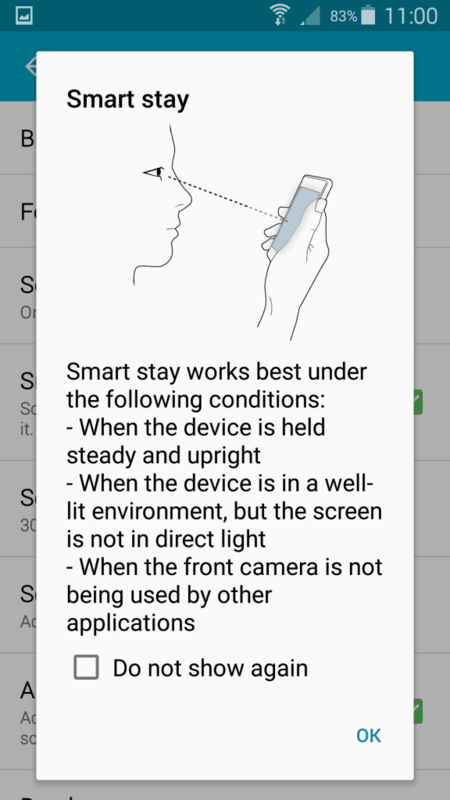 Samsung devices also have a special feature of their own in the Display settings called ‘Smart stay’. This feature uses your phone’s front facing camera to watch you watching the screen and as long as your face is detected the screen won’t turn off. 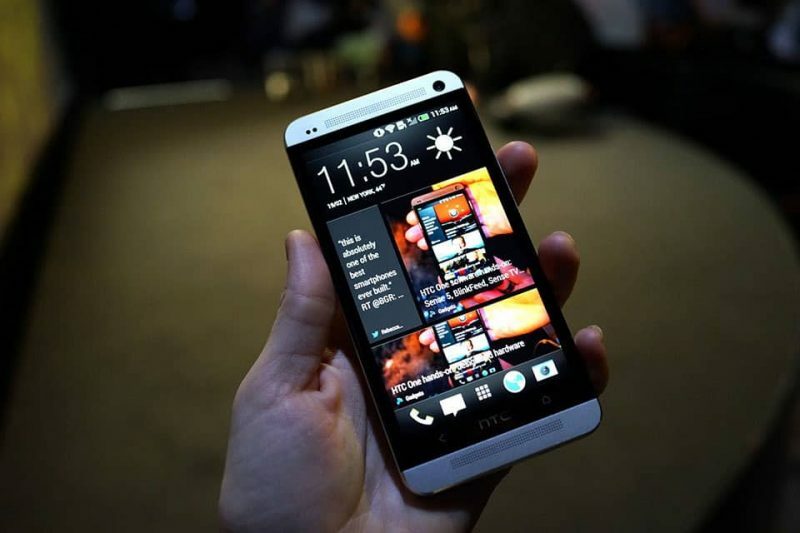 It’s been available since Samsung galaxy S3 and in many situations it’s absolutely perfect. However, not every Android user owns a Samsung device and Smart Stay will need your face in front of the screen to work and a well-lit environment so it’s not a guaranteed solution. Stay Alive is one of the most feature-rich apps of its kind and besides the ‘Keep screen alive on AC/USB power’ which is the Developer options feature we just talked about, the rest are undeniably useful. Many of the app’s features are free – you can use it to keep the screen on at all times, for any of your installed apps, while your phone is in a desk dock or in a car dock and more. 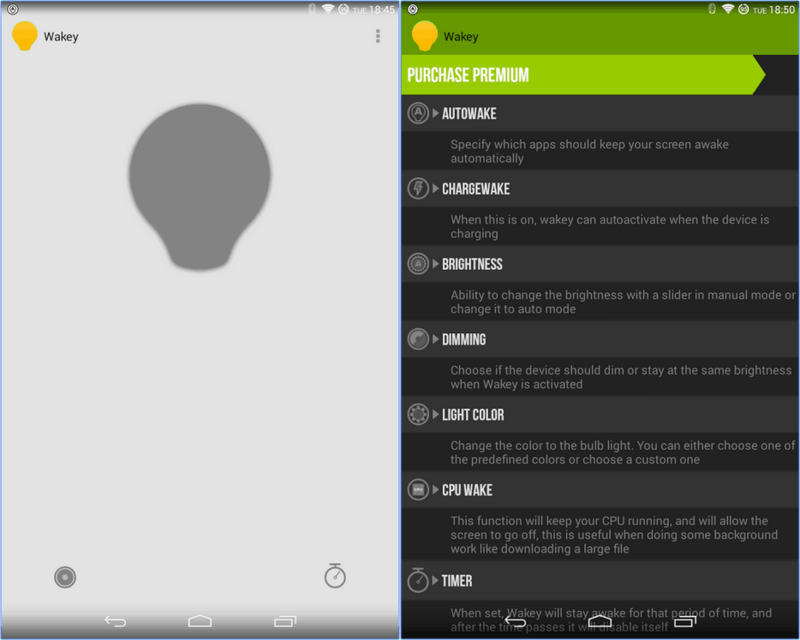 The so called premium features are worth taking a look at as well – they let you make the app launch automatically on boot, keep the screen on while it’s locked, hide the top bar icon and a battery saving black screen floating clock among others. The good news is the in-app purchase is a donation so you get to choose how much money you pay for these features, and the regular version of Stay Alive is ad-free. Wakey is another utility app that lets you control how and when your phone’s screen should stay on but you get only a few basic features for free: the option to keep the screen lit until you decide otherwise, a timer and the ability to dim the screen while awake. The rest of the features are premium and you can buy them together or separately. 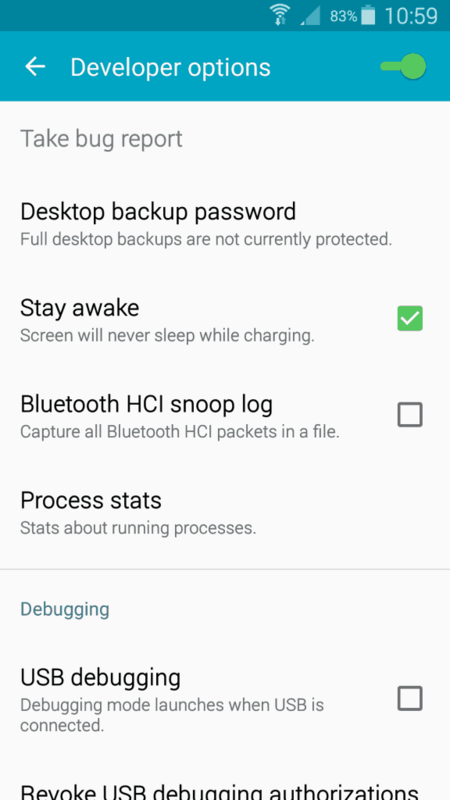 AutoWake will let you control screen timeout on a per app basis, CpuWake can keep only the CPU awake – perfect when your phone needs to do some work in the background, a brightness controller and ChargeWake which can keep the screen awake while the phone is charging. I have to be honest, Caffeine is my favorite app from the bunch and I saved the best for last. This app is free (although donations are accepted) and has a solid set of features. You get the ability to keep the screen on for specific apps, when the device is connected to an AC adapter and/or to computer. 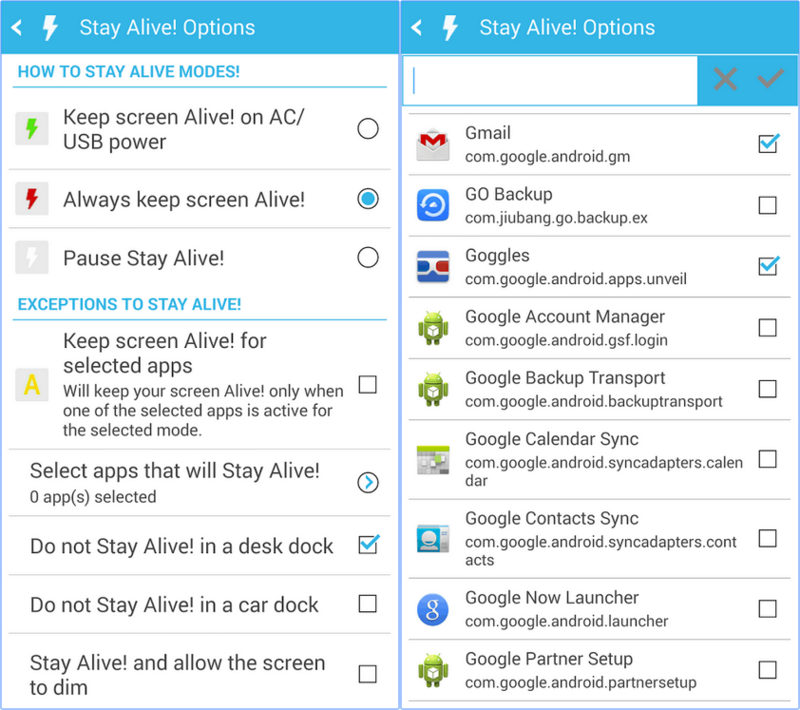 It doesn’t have a ‘driving mode’ like Stay Alive, but it is the most feature rich free option when it comes to controlling the screen wake behavior.